Tennis tournaments are commonplace at Western Racquet Club, as one would expect. In fact the Men’s Member Guest Event has been held annually for many years. Timon Corwin, General Manager, wanted to find something unique and different that participants would enjoy, while staying within their budget. 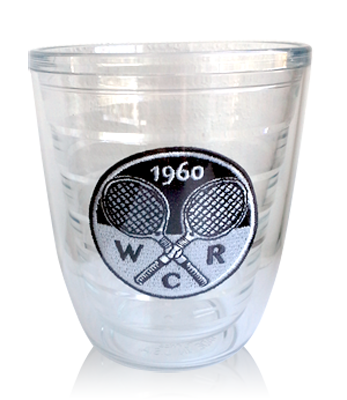 Michael Wolaver recommended the double-wall, Tervis-style Tritan tumbler with the Western Racquet Club embroidered patch inside. This is a classic style, higher end tumbler that keeps drinks colder since it is lined with a double wall. This means your hand does not warm up the glass when holding on to it. With the double wall, we are then able to insert a unique embroidered patch between the two walls, providing a memorable and eye-catching look. According to Corwin, other promotional items were not even considered after Michael presented the tumbler idea, sharing, “Magellan Promotions always suggests good options. This just happened to be the first one, and I liked it.” The tennis event participants agreed wholeheartedly, as the tumblers were a huge hit! Western Racquet Club staff handed out the tumblers as a parting gift at the end of the night. Tervis-style tumblers are extremely popular at retail, known for their durability and unique look. A double wall construction means that drinks will hold their temperature for longer time periods. The outside layer of the Tritan tumbler is always clear. The inside wall can be a solid color or decorated with a fully imprinted wrap or an embroidered patch. Encasing a patch has a retro, unique style and was the perfect way to showcase Western Racquet Club’s new logo design. The attendees loved the tumblers! Their reception was so overwhelmingly positive that Corwin decided to use them for the next two events that are being planned. The tumblers give Western Racquet Club strong brand exposure with a high quality, useful beverage container that will be kept and enjoyed for many years.